As you might already know from my last DIY wall art project, I tend towards a modern style. I also kind of have a thing for geometry. 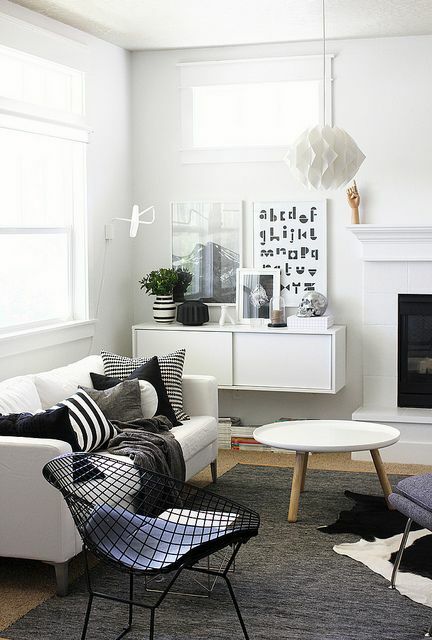 While we don’t always have the same home decor preferences, I think an overall modern style is one thing that my husband, Dave, and I actually agree on when it comes to interior design choices (thank goodness! ), so I’m glad that I can indulge in these types of modern pieces and he won’t be totally opposed to it. 🙂 In any case though, I get a great sense of satisfaction from making art that’s both abstract yet very linear and structural, so this was a fun one for me whether or not it’ll stay hung on the wall. 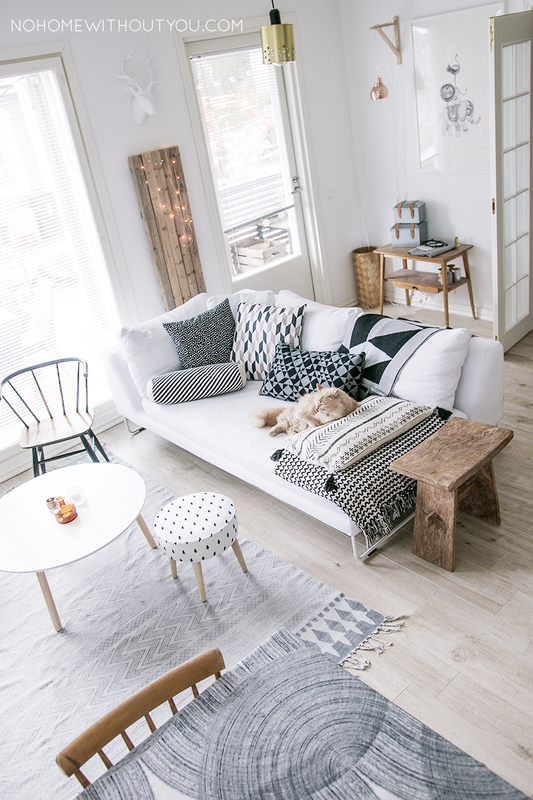 Seeing as my home will never be as perfectly clutter-free as those gorgeous Scandinavian homes, I’m not about to try and mimic that exact aesthetic in my home decor. I also wasn’t about to make a pillow, as I have a strong love / hate relationship with my beloved sewing machine. But since I was so inspired to make something, anything really, this easy modern black and white painting project was going to have to do! Tape off three to four parallel stripes on an angle at the top corner of your canvas with your painter’s tape. Press down and smooth over the tape so that there are no bubbles, and run the tape all the way over the sides of the canvas. 3. Carefully remove tape while paint is still slightly wet. If you wait until the paint is too dry, it will crack and come off with the tape. Don’t worry about any unevenness – you can touch it up at the end! 4. Once the first corner you’ve painted is dry, tape off another three to four parallel stripes on an angle on the next corner of your canvas. You can choose any angle you want, just take your time to make sure that once you lay down the first stripe that the rest of the stripes are parallel. 5. Repeat step 2 on this area. 6. Again, remember to paint all the way over the edges. 7. Remove tape carefully while paint is still wet. 10. Use a small brush to touch up any mistakes or stray black paint marks throughout your painting. And then you’re done! You can hang it any way you’d like! As you can see here, I rotated the canvas once counter clockwise before I hung it. Are you a fan of modern geometric art? Feel free to check out my abstract triangle wall art and cross pattern wall art!